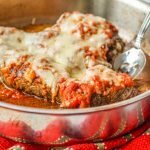 These cheesy pizza beef rollups are a fun and delicious low carb dinner you can make with one pan. Thin beef steaks are stuffed with melty, gooey cheese and topped with low carb sauce to make a tasty weeknight meal. Depending on the size of your thin sirloin steaks, cut them so they are relatively rectangular. I was able to add 1 1/2 slices of provolone to mine and made 6 beef rollups. You can make yours small if you wish. Heat oil in a large oven proof skillet. Add the beef rolls and brown all sides. This should take about 10 minutes. Take off stove and judiciously add the marinara sauce on each roll. Top with the shredded cheese and set in the oven. Bake for 20 - 30 minutes or until the meat is cooked.